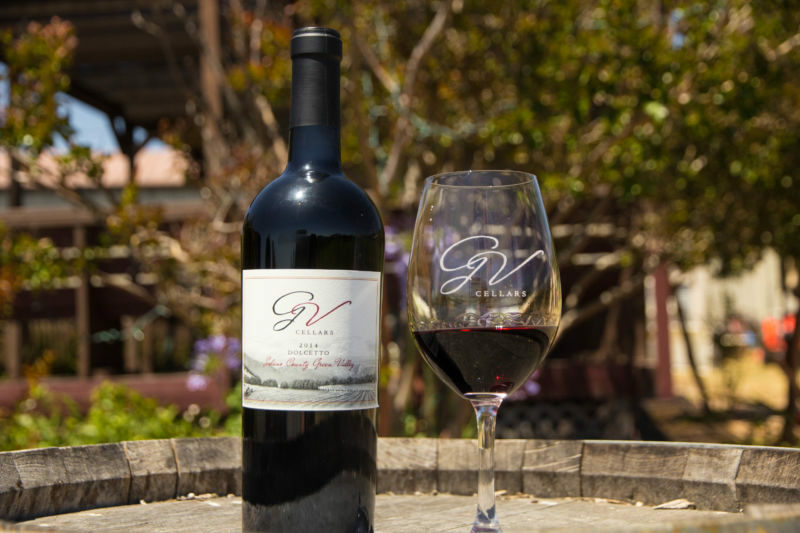 I was first introduced to G V Cellars about a year or so ago by our friends Josh and Lynn who are members there. The day we visited, I didn’t actually taste the wine, but The Brit did. I remember thinking how beautiful the area was; a true rustic hidden gem. 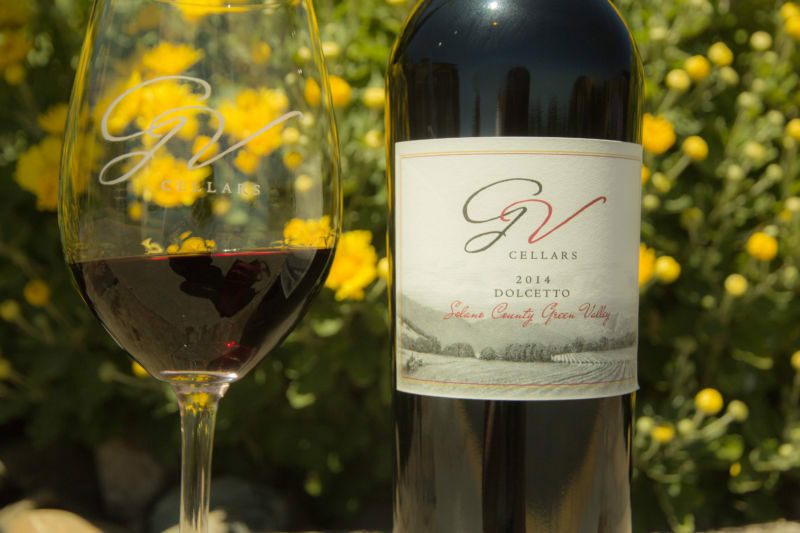 Several of our friends had suggested we talk about G V Cellars in our blog. 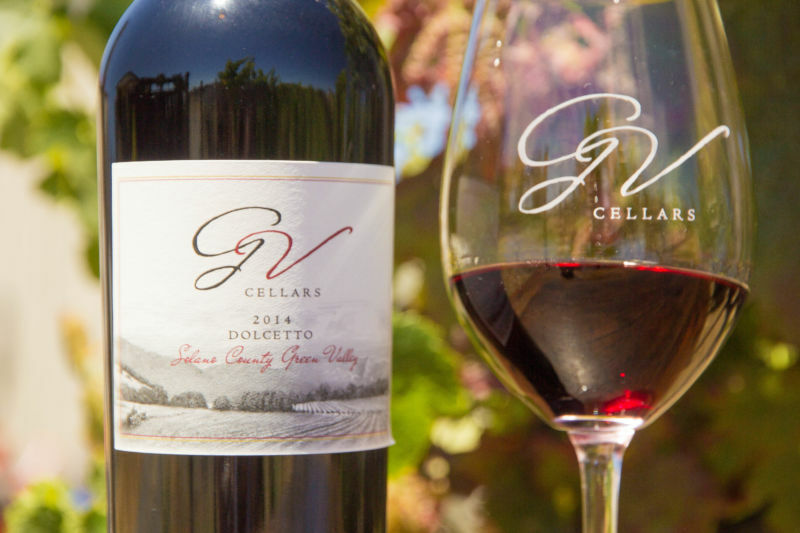 They are a discerning group of wine drinkers, who have memberships at wine clubs all over Napa and Suisun Valleys. The guys over at The Napa Deli also suggested we talk with them. Finally, I ran into Ken, who is the interim wine maker at G V Cellars, as I was leaving The Napa Deli. I took that as the final sign that I needed to visit this place for the blog. 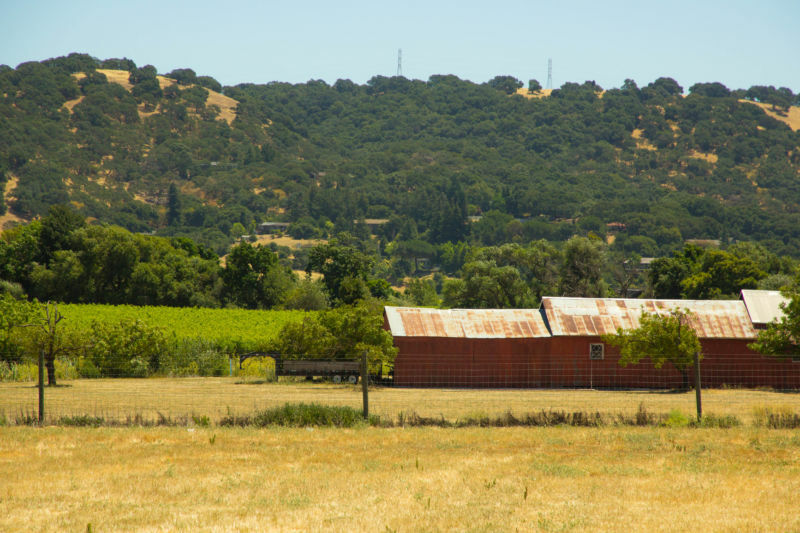 Set in its own little valley, on the back side of Napa right where the 80 and the 12 meet off the Green Valley exit, sits G V Cellars. It is very rustic, as it was built in the seventies, but is well maintained. You can tell that the owners put care into their property. They have lovely little touches of landscaped flowers and pleasant little areas for their visitors to enjoy. Outside, they have a couple of covered decks to sit and enjoy the wine. They allow you to picnic there with purchase of wine. 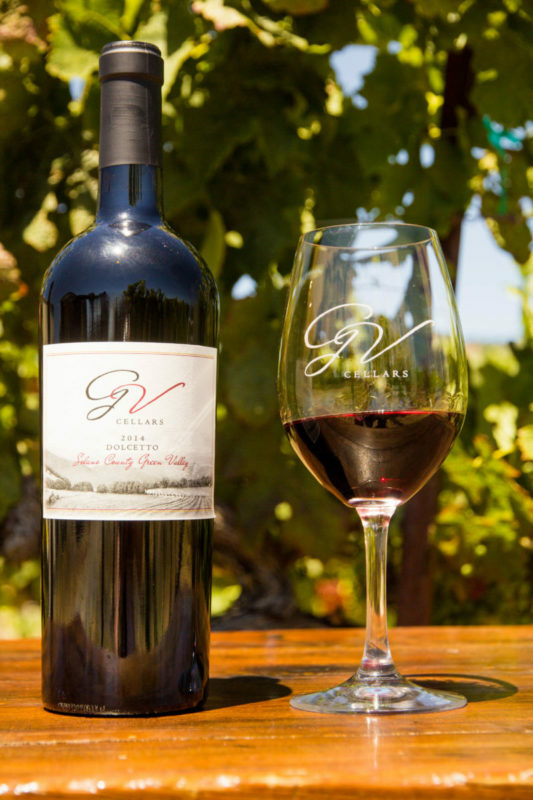 Perfect pairing – The Napa Deli and then G V Cellars to enjoy an amazing meal in a vineyard. It won’t be crowded like V. Sattui, or suffer from endless traffic and crazy tourists either. This place is quiet and serene; a true hidden gem. The tasting room is dated, clad in wood strips. It is a dark space, but what it lacks in modern decor it makes up for with friendly, warm staff and a relaxed atmosphere. It is unusual as you have to enter the tasting room up a flight of stairs. But once you get up there you see why they chose that space: THE VIEWS! 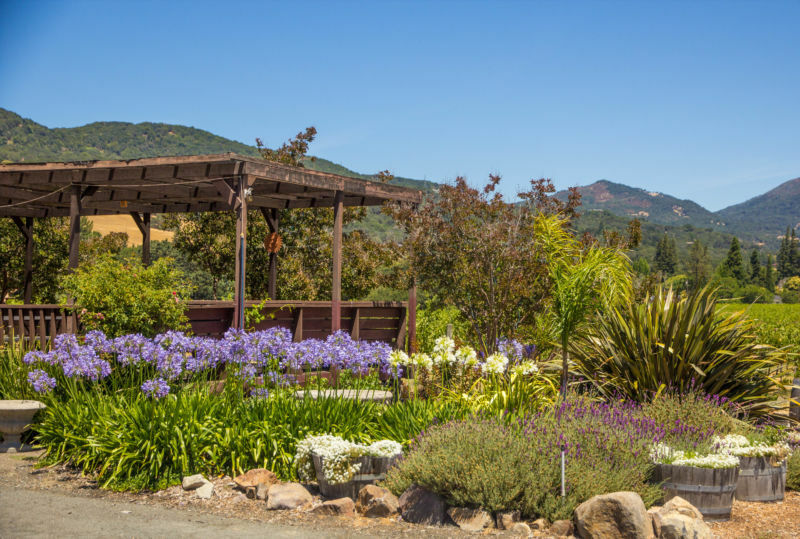 You get a beautiful panoramic view of the valley and the vineyard. There is a deck off the tasting room to sit and enjoy. It is especially beautiful in the spring when the hills are a lush green, wild flowers bloom everywhere, and the yellow mustard carpets the space between the vines. Again, this is a place where the people make it extra special. The wine host Ed is charming and The Brit and I really enjoyed talking with him. One of the things that I liked about Ed was that he spent time trying to get to know our likes and dislikes in wine so that he could pour us things we would enjoy. I found that refreshing. We don’t tend to like sweet wines, so why waste it? (The exception being if we are working for the blog to write tasting notes.) Do you see the suffering we go through for you our readers? It’s not all just sunshine, fabulous food, amazing people, and drinking great wine ya know. Well OK, it is. I had the pleasure of meeting with Vicki McKeown who is the General Manager. She took me through the history of the vineyard; starting with the Volkhardt family and how it was purchased by its current owners in 2005. 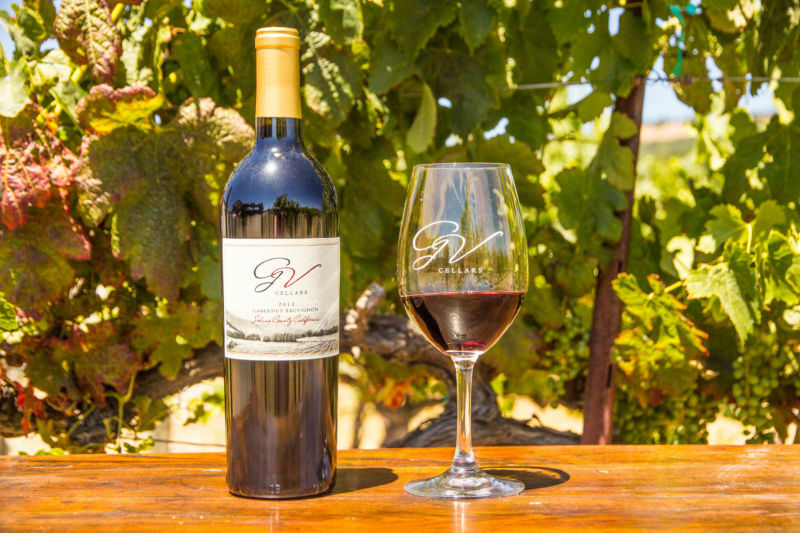 G V used to act as custom crush facility for other wineries, but it is now focusing on its own wines and slowly phasing out that part of the business. Their G V wines are so good they deserve to have the focus on them. The Brit comments: I agree that G V cellars offers a good variety of wine, much of it grown on the estate. hey have twenty-nine acres planted; a mix of Merlot, Syrah, Cabernet Sauvignon, Dolcetto, and a Cabernet Franc. They are, for the first time, planning to use that Cab Franc to make a single varietal. In the past they have mixed those grapes at harvest with the Cabernet Sauvignon; a process that was described as field blending. I got the opportunity to tour their Barrel room and where the magic is made with the fermentation vats. It was very neat. 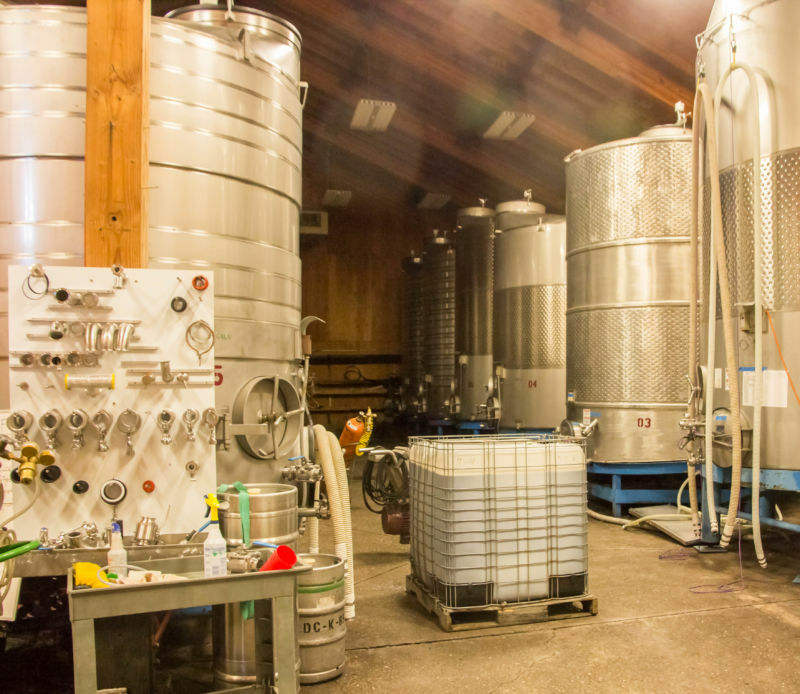 This is a working winery and there are no frills. They will get there I am sure when people discover their affordable, varied, and tasty wine selection. As she and I chatted, I found out some really interesting things about this little hidden gem that I think makes it even more awesome. First of all, they allow people to rent out their space for a minimum of $300 for 30 people. It is $10 per each guest after that. Birthdays, graduations, baby showers etc. Who wouldn’t want to have their event at a gorgeous country vineyard? Weddings are also available for an extra charge (as they have to close the entire winery for those), but still very affordable. Any kind of event in Napa Vineyards cost an absolute fortune. This is a steal. Sign me up for a party there! In fact, I have a big birthday coming up next year (number not to be mentioned) and I think I will do it up there! Another cool thing is that they have thirsty third Thursdays. For $10 you can go get a hamburger or hotdog and enjoy their wine while taking in the view. They have a band and a really fun feel. I think that is a great deal. The event goes from 5:30 -8:00 p.m. The Brit is rarely home from his tech job in San Francisco to attend, but hey, I can always go with my girlfriends. He would get there in time to be our designated driver. Perfect night! The Brit comments: I am not sure that I see that as a perfect night. 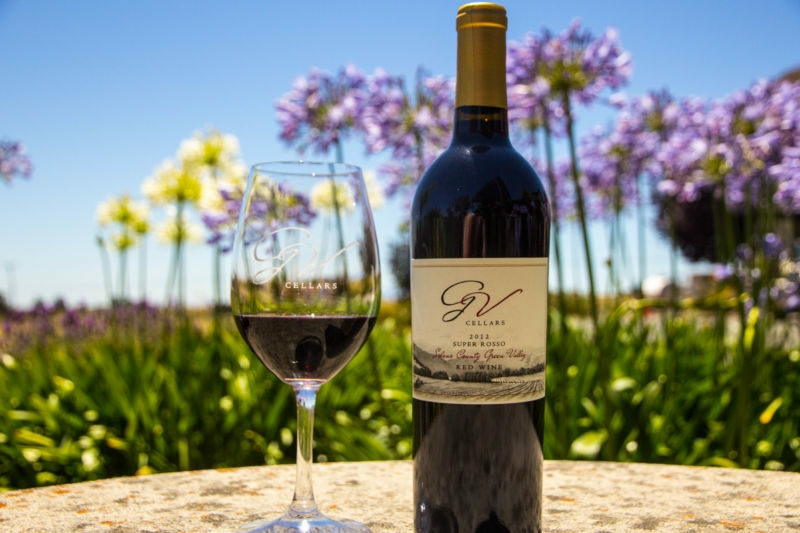 GV Cellars has a great wine club with lots of members events. Unlike many wineries, the events are open to the public for a small fee ($15-$20). They have events which include food trucks and catered parties with bands. Sometimes it’s just nibbles and wine. They try to mix it up. Their main focus seems to be to have a great time. Pricing will vary depending on the wine makers selection for that month. We are going to talk about the wines specifically in another post, but I want to let you in on a little tip: buy the 2014 Dolcetto! It is affordable, approachable, and just plain good. How does it taste? Well, I would say if a Malbec and a Pinot Noir had a baby, this would be the Dolcetto. For $23 it is a fantastic buy. Unfortunately, they don’t sell this beauty in the stores, so you will have to make a trip out to collect some. Tell them that California Girl sent you! The Brit comments: When California Girl returned from her talk with Vicki, I knew that it would be the Dolcetto that would impress her. I am pleased that I know her taste so well. Full details in our post on the tasting.